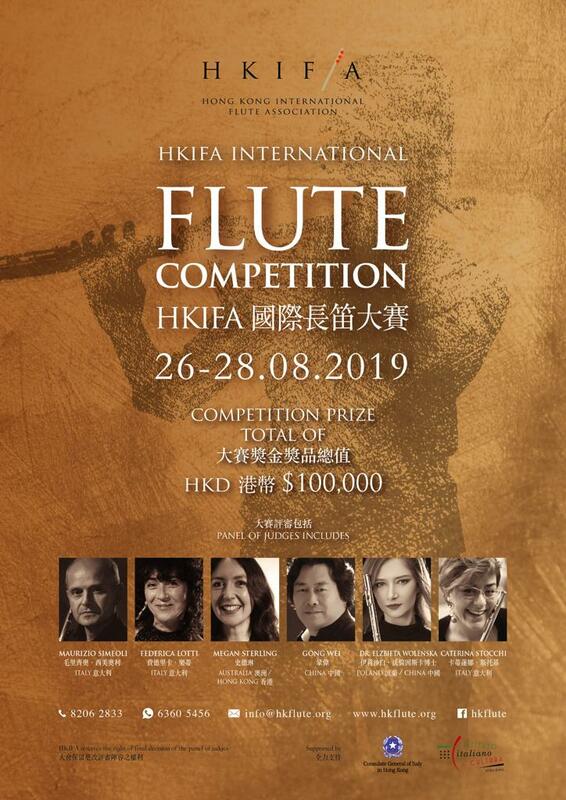 HKIFA presents Hong Kong International Flute Festival 2019 is going to hold the 1st HKIFA International Flute Competition! We proudly presents our head of judge panel Professor Federica Lotti (HKIFA Overseas Consultant and Flute Professor at the Venice Conservatory of Music) together with our judges: Maestro Maurizio Simeoli (former Principal Flute at the La Scala Philharmonic Orchestra), Megan Sterling (Principal Flute of the Hong Kong Philharmonic Orchestra), Elzbieta Wolenska (Polish Flutist and Flute Professor at the Zhaoqing University), Dr. Kristyn Son (Korean American Flutist and Flute Professor at the Kansas State University) and Italian Flutist Caterina Stocchi! *HKIFA Young Artist Competition and Hong Kong International Flutist Award participants are required to submit video recordings for the screening round. We are also going to award one “Stile Italiano” Award to the above group for the best performances on the Italian repertoire. Don't miss the chance to meet flutists from all over the world!